People for Animals Hyderabad, an NGO devoted to fighting for animal rights as well as animal welfare at Hyderabad, has spent over 15 years fighting for the cause. We are proud to provide excellent and compassionate care to all animals, and to raise awareness to make the city more compassionate towards the voiceless. We are relentlessly working towards materializing our vision: A world where social sanction would deter violations of animal rights, where animals and environment are understood and accepted as being an intrinsic link of the chain of life. On 20 August 2017, 33 camels, including two baby camels, that were being taken for slaughter were spotted. 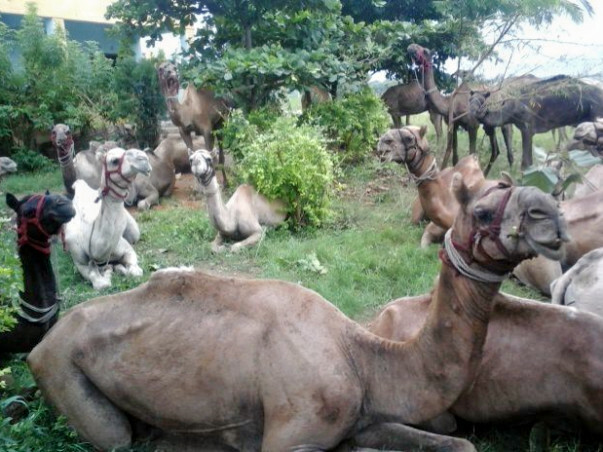 These poor camels were made to walk all the way from Rajasthan, with the motive of selling them off in the meat markets at Hyderabad for slaughter. Camels are the inhabitants of Rajasthan and are not suited to the climate and soil of the state of Telangana. The general diet of the camels is shrubs and plants that are found in and around Rajasthan. 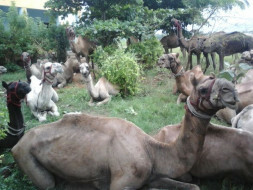 Rampant illegal sale and slaughtering of camels has become a common phenomenon in the Hyderabad city during festival seasons for quite some time. Several camels are gruesomely slaughtered in contravention of the rules and several sections of the law. Illegal entry and slaughter of camels is a violation of Section 429 of IPC and other laws. It mounts to cruelty towards animals as defined under section 11 of PCA Act. It is a cognizable offence under section 428 and 429 of IPC. Moreover, the camel is the state animal of Rajasthan and smuggling them out without permission for slaughter is also a crime. On 20th August 2017, Team PFA led by Executive Officer Mr. Dattatraya Joshi; and volunteers sprung into action and stopped the camel handlers. An FIR was lodged against the accused on the same day and the interim custody of the animals was granted to PFA. We need at least 1,000 kgs each of two varieties of camel feed, called Kutti (straw powder mixed with nutrients, ideal food for camels) and Bhoosa (consists of straw powder only). 1 kilogram of kutti costs about 50 rs and 1 kilogram of bhoosa costs around 30-40 rupees. Also, the pregnant camels require better nutrition and the lactating ones do too as they're very weak right now and aren't able to nurse their young ones properly. Along with these, fresh green leaves also need to be fed to maintain a balanced diet. Transportation of a large number of camels is a difficult, slow and expensive process. We shall need to hire at least 8 trucks to fit the 33 camels, 4 in each truck. The camels are carefully lifted using a crane as they’re too scared to walk into the trucks voluntarily. The process takes about 48-72 hours. The trucks are then made to move slowly at about 20-30 kilometres per hour, halting in between to feed and rest the animals. The ropes are untied frequently and the camels are made to move around within the trucks for exercise. We need to travel across Maharashtra, Gujarat and Rajasthan to reach the destination, PFA Sirohi. The entire journey takes over seven days. We shall need to hire at least 8 trucks to fit the 33 camels. We shall also need a crane to carefully lift up the camels, one at a time and place them in the trucks. The crane is hired on an hourly basis. As the entire process takes about 48 hours, based on how the camels cooperate. We require as many donations as possible at this stage towards food, medicine and the upcoming transportation. We request our supporters to contribute as per their capacity and help us with upkeep, rehabilitation and transportation of the innocent camels back to their homeland. We would also like to thank all the Good Samaritans on behalf of the numerous animals under our care. We at People for Animals cannot do what we do without the generous support of caring individuals such as yourselves. We hope that you will provide your kind contribution towards the cause. 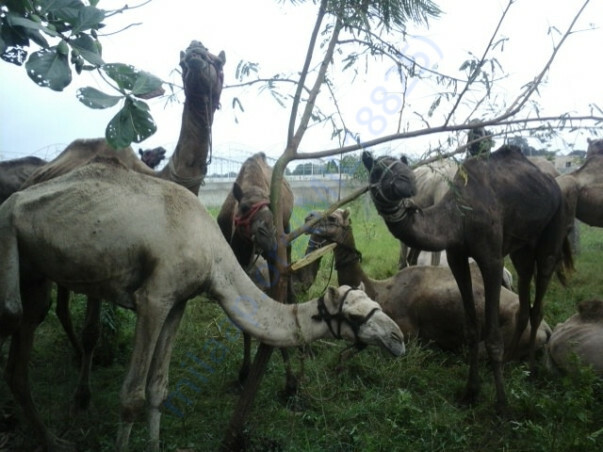 We are happy to inform you that the camels have now been safely transported to Rajasthan. However, we request you to support the organization by spreading the word in your circles about the work that we do, so that we can keep up our life saving work in terms of rescues, cruelty prevention and smooth running of the emergency rescue home.